A safety controller that is easy to use and implement can make a big difference in getting your safety solution up and running quickly and effectively. But a safety controller is just one piece of a safety solution. A safety controller is the backbone of any safety system, so it is an important element to get right. Read the article to learn how to choose a safety controller that makes machine safety simpler and that has the flexibility to accomodate changing requirements. Please note, the following article is for educational purposes only and is accurate as of the time of publication. We recommend discussing your specific application requirements with a safety expert. Machine safety is often complex and daunting, but it can be more intuitive. An easy-to-use and flexible safety controller will make it much easier to get your system up and running quickly with minimal downtime and will allow you to easily expand and adapt to future needs. The following are 5 key features to look for in a safety controller that will save you time and costs, as well as help ensure that operators are using the safety system correctly. As with any safety application, you should consult a safety expert about your specific application requirements. Intuitive programming saves time and costs. An icon-based, drag-and-drop user interface reduces the learning curve and speeds up commissioning. This also makes it easy to quickly modify and update the configuration when changes are needed. Note that many safety controllers have password protection to ensure only authorized users can make changes, reducing the risk of operators bypassing the system. The XS26 expandable safety controller from Banner includes software with a seamless user interface for setting up and managing safety systems. The XS also has a built-in display and a micro USB connection to easily connect a PC or download a configuration from the XM memory card. 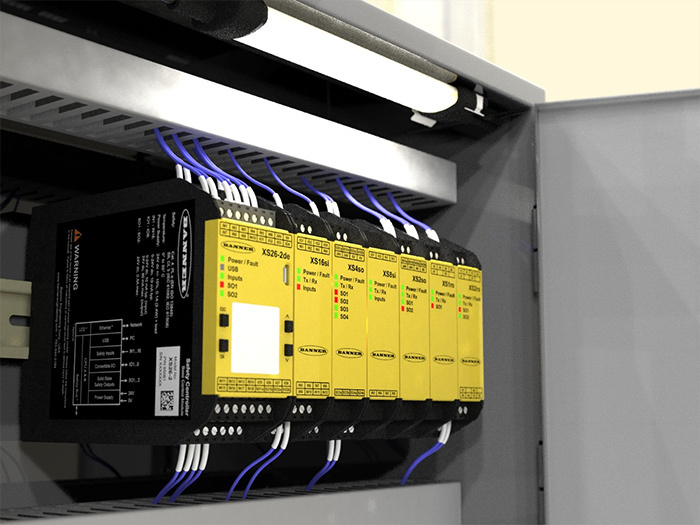 A safety controller interface that automatically generates wiring diagrams speeds up installation. Once you have set up a safety system configuration in the safety controller software, safety controllers like the XS and SC from Banner will automatically provide wire diagrams of your configuration, making it easy to commission your configuration. Live simulation allow users to test configurations quickly. Look for a safety controller that offers a simulation mode so you can quickly test new configurations and changes prior to implementation. (Note that simulations do not replace commissioning checkout procedures on installed systems. Always follow required procedures for installed systems detailed in the product instruction manual). An expandable controller provides flexibility for changes. Changes are the only constant in life. Having a safety controller that can expand when you need it (especially with last minute changes) allows for the required agility to meet deadlines and implement changes quickly. In addition, an expandable safety controller lets you increase the number of inputs with expansion cards as safety devices get added. You can also increase the number of outputs with expansion cards as the need to safely control the machine changes. Here again, intuitive programming is important and helps make it quick and easy to implement changes. Finally, real time fault monitoring allows quick identification of problems. Look for a safety controller that can communicate with your PLC via Profinet, Modbus, TCP/IP, PCCC, etc. This allows you to remotely monitor your safety devices and will ensure that you are notified in real time when there is an issue with the safety system. In addition, with configurable IO, inputs can be changed to non-safe outputs to control indication lights for local notification of a fault. For example, XS26 and SC26 safety controllers can communicate via Profinet, Ethernet/IP, Modbus, and PCCC up to 256 virtual status updates to a PLC and/or HMI that can be stored and tracked for future analysis. Furthermore, these controllers can also receive up to 80 virtual non-safety inputs to remotely turn safety devices or indicators on and off, enable mute functions, cancel off-delays, initiate a reset, and accomplish other tasks quickly and easily in the HMI without complicated programming. A safety controller that is easy to use and implement can make a big difference in getting your safety solution up and running quickly and effectively. But a safety controller is just one piece of a safety solution. Banner Engineering provides a complete portfolio of easy-to-use safety devices--along with LED indication--to make managing complex safety systems simple and intuitive. Contact an engineer today to learn more.